The operatives of the Rapid Response Squad, RRS, in Lagos have arrested three ‘one-chance robbers’ on the Third Mainland Bridge. Following police chase, one of the suspects jumped into the Lagoon with the gang’s loot to escape. 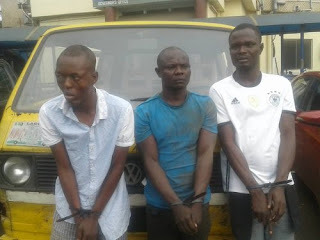 The RRS said the robbers including, 27-year-old John Akinyemi; 37-year-old Paul Oliseh, and Amos Williams, were arrested on Monday afternoon on the Third Mainland bridge. 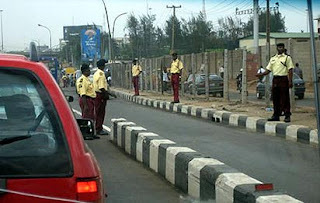 RRS said that its men monitoring the Iyana-Oworo axis of Lagos chased and arrested the suspects after a tip-off. They chased the one-chance robbers operating from a Volkswagen transporter bus with registration number, AKD 562 XP to the bridge. Police said the robbers abandoned their vehicle and were fleeing on foot when they were arrested. The leader of the gang, John Akinyemi, disclosed to the police that there are four of them. “I’m in charge of calling the team to work. It was our first trip for the day. We got four passengers in Estate Bus Stop in Alapere. They were going to Oshodi. We dispossessed them and dropped them off before Iyana-Oworo one after the other. One of the victims, Semiu Oluwaseun, who alerted the RRS officers immediately he was thrown out of the speeding bus, said the robbers collected his phone and the sum of N500,000. Another victim, Jamiu Ojuroye, who was robbed on Sunday, identified John Akinyemi, as the driver of the bus. He noted that he was robbed on Sunday night and that he was robbed of N150,000 before they threw him out of the speeding bus. Ojuroye added that after struggling with the robbers, they sprayed a peppery substance in his face, took his money before throwing him off around 8pm. The robbers were paraded today by the Lagos State Commissioner of Police, Imohimi Edgal, at the Command Headquarters.